The Hobbit is J. R. R. Tolkien’s prequel book to the Lord Of The Rings. They’re making it into 3 movies (was originally 2 movies, but they’ve upped it to 3). I’ve followed along over the last year as they’ve posted snippets from the filming process, since I really enjoyed the book when I was younger and loved the Lord Of The Rings movies. So what can we learn from the hobbit gardens? The Shire has some wilderness right? Maybe a little bit of manicured lawn, but not much. That reminds me that our organic gardens should have a wild spot, too. Ideally, the whole lawn area might be allowed to grow wild, unless you’re planning to grow food or something else there. But of course there are aesthetics to consider, and if you live in the city, you probably won’t be allowed to do just allow nature to decide what grows and how big it gets. But even a few hundred square feet in the back yard would be great. Or just 100 square feet in the back corner of the yard would provide at least some important services. Perhaps the most important service is that it will contain some weeds, grasses and maybe wildflowers. That means it will hopefully contain corresponding microbe, insect and animal life, a bit of a refuge for our beneficials. A wild area can also tell us a lot about our soil conditions. When we see what comes up and how it responds, we learn about not only moisture conditions, but chemical and biological conditions. That can really help with our soil management decisions, including which organic fertilizers and perhaps microbial inoculants to apply. Hobbits like to drink beer and socialize. Phil prefers smoothies and reading, but either way, making some room for relaxation is more fun than toiling in the vegetable garden from dawn to dusk. To accomplish this goal, we need to do a little bit of intelligent design up front, and a bit of soil improving and mulching in the first couple of years. That’s what I teach in the Academy. Then we have a garden that largely takes care of itself. That’s how I can leave my organic garden for a month or two at a time without much worry. No, I’m not in New Zealand. I’m actually writing this from a cafe in Eureka, California. Heather and I are on a road trip from Victoria, B.C. down to San Francisco and back (hi mom and dad). We hiked Hurricane Ridge in the Olympic mountains on day 1, which was awesome, and we’ve meandered this far down the coast in the 2.5 days since then. 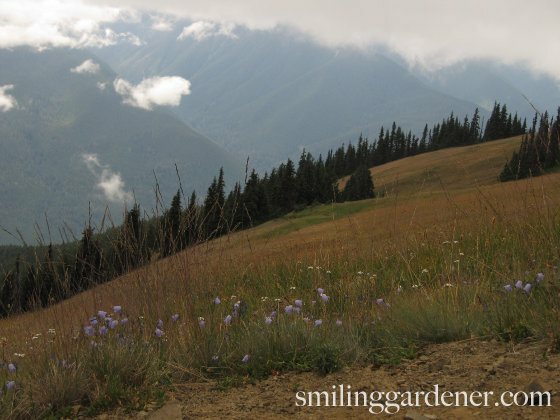 The grass and wildflowers during our hike in the mountains are what reminded me of the hobbit garden. Heather took the photo above on our hike, which is focused more on the view than the grass, but that’s what I’ve got. I filmed a couple of organic garden design modules with Christina Nikolic, an excellent ecological landscape designer who also took over the Organic Gardener’s Pantry from me in 2010. Those lessons are now up in month 6. I filmed some seed harvesting/saving/storing videos with Heide Hermary, founder of Gaia College. We covered all kinds of stuff in her fruit and vegetable garden. That will go up in a later food growing section. I’m on such a roll that I may get the rest of the Academy filmed by the end of this year, after which I’ll go back through and add some interesting footage on top of some of the existing videos. I’m not sure if I would’ve had the guts to start this course if I knew how long it was going to take to put together, but now that the filming is 75% done, of course I’m thrilled I’m doing it and glad everyone is getting so much out of it. Thanks for your support! So, any questions? Any more ideas for what we can learn from the hobbit gardens? You will enjoy my son’s soon to be released book, Wisdom of the Shire (see shirewisdom.com) which, among other subjects, speaks to the Hobbits love of gardening. Yeah! If you head back north on Pacific Coast Highway, stop off in Waldport, Oregon and see our communty garden at the literacy center, where we are using permaculture techniques for our second year…it’s getting there and proves that you CAN grow vegetables on the coast. Thanks for the tip! I’m not sure if we’ll stick to the coast or not, but I’ll definitely make a note. Wow! I am looking forward on the movie. I am a fan of LOTR. Anyway, those tips are just great. I really enjoyed reading the post. Thanks! Hi Frankie, I’ve always used one by Vee Gee, but I’ve also used the much less expensive ones you can get on Amazon, and from I can tell, they do a pretty fine job and are great for home gardeners. Growing vegetables on the coast: does that mean the east coast as well, probably more south than north?